On April 3, 1949 Israel signed a ceasefire agreement with Jordan. This agreement made an armistice line and until 1967, Jordan occupied what is now called the West Bank. However, this land is now Israels just as Gaza was before they handed it over to the Palestinains in the early 2000s. What many miss is that the land behind the armistice line is Israel’s land. The news and politicians like to play it as land that Israel tries to control. This week Chris will walk us through the history and the issues around this dotted line on the map. As Christians who support Israel, we want you to be educated on issues modern Israel faces. This is another way we can stand with Israel and love the Jewish people! Steve Conover: If you ever look at a map of Israel, you'll often find a line that divides the West Bank from the rest of Israel. That line is called the Green Line, and there's a lot of misunderstanding today about what that line represents. This is the Friends of Israel Today. I'm Steve Conover. Chris Katulka: And I'm Chris Katulka. Steve, you're right. This month marks 70 years since the creation of the Green Line. And even today there is a lot of misunderstanding about what it is and what it divides. Politicians and world leaders have been talking about it for a long time. Today on the program, we're going to look back at the history of the Green Line and highlight some of the misconceptions that surround it, because I believe the Green Line should be remembered more as modern Israeli history than a current reality. Steve Conover: Looking forward to hearing more Chris, but first in the news, US senator Lindsey Graham, a Republican from South Carolina said he will urge Congress to recognize Israel's sovereignty over the Golan Heights. Israel captured the Golan Heights from the Syrians as they were defending themselves in 1967, and then annexed the land. However, the international community doesn't recognize Israel's control of the area. Senator Graham said to give this territory up would be a strategic nightmare for the state of Israel. Chris, what are we to make of all this? Chris Katulka: Yeah. You know, just last November in 2018, the UN General Assembly attempted to pass a resolution forcing Israel to return the Golan Heights to the Syrians. Well, fortunately former Ambassador Nikki Haley opposed the resolution. And this is why it's good that Senator Graham is introducing the recognition of the Golan Heights to Congress. I think a lot of times we just think about the recognition of Jerusalem with Israel. But there are other areas where the international community is looking away, and doesn't believe Israel has a right to certain land. And the Golan Heights is incredibly strategic for Israel. Number one, the Golan Heights is a part of biblical history, when Israel in the Old Testament was under Solomon's rule, the Golan Heights was a part of Israel at that time. So we definitely know there's history precedent there. But on top of that, today in a modern sense, the Golan Heights serves as a strategic buffer that stands between war-torn Syria, and we all know what's happening in Syria right now, and the modern state of Israel. The other day I was looking up a location in Israel on Google Maps, and when I typed in Israel, Google brought me to a view of Israel where I could see everything. I could see all of Israel, some of Jordan, some of Syria, and Lebanon, and Egypt to the south, and right in the middle of Israel's picture from Google maps, like most maps, is this dotted line that forms almost like a half circle or, or even closer it looks more like a half wing of a butterfly. The dotted lines on Google Maps, when you look at it, it actually kind of reminds me of my kid's project in kindergarten, you know the dotted lines to tell them where to cut. The dotted lines on Google Maps, and like I said, on most maps, represent what's called the Green Line in Israel. Now if you zoom in really close on Google Maps, like get as close as you possibly can, you'll find that Google accurately calls those dotted lines the 1949 Armistice Agreement Lines. Those lines are what global politicians used to divide the West Bank, which many Jewish people call Judea and Samaria from Israel. We're chatting today about the Green Line because on April 3rd, 1949, 70 years ago, Israel signed a cease-fire agreement with Jordan to ultimately bring to an end the war that Israel fought was Jordan, Syria, Egypt, Lebanon, and Iraq to gain their independence. Now I've heard two reasons why people call the Armistice Line that divides Israel from the West Bank, the Green Line. The first is from locals that have told me the Green Line represents where the tree line ends before the Judean and mountains begin. And it's a visible green line. I've seen it and I can understand why people would call it the Green Line, when you just see the trees stop and then the mountains begin to ascend. Well, the other, is that while armistice talks were going on, it was green ink that was used to draw the line on the map. But either way it's called the Green Line. And it represents the Armistice Line that was signed between Israel and Jordan. But we have to go back here. Why is the Green Line called the 1949 Armistice Line? Well, you actually have to go back a few decades from 1949. Tensions between the Jewish community, and Arab community of British Palestine, which is now called Israel were elevating. These two communities that actually once lived side by side, started to divide because the British, who once had control of that area, promised to give the land to the Jewish people to start a nation. And this frustrated the Arab community. And from the early 1920s to the end of the 1930s, Arabs would often attack Jewish people. One such attack was the Hebron Massacre where the Palestinian Arabs became very violent toward the Jewish community because they heard rumors that the Jewish people were going to the Temple Mount to take control. Well the Arabs actually killed around 68 Jewish people that day. And these type of killings happened for nearly 17 years. And as that happened, the British excitement to see a Jewish state come to fruition started to diminish. Certain Jewish groups like the Irgun and the Stern group responded to these Arab riots and they became violent themselves. The Jewish Agency, which was the Jewish government in Israel before 1948, they rejected the actions of Irgun and the Stern group against the Arabs at that time. So between the 1920s and the 1940s, fighting to prevent the creation of a Jewish state was happening between the Jewish community and the Arab community in British Palestine. Now, the UN General Assembly meets on November of 1947, this is where you kind of have to start putting a timeline together. The UN General Assembly meets in November of 1947, and the world agreed on what's called UN Resolution 181, which gave Jewish people the right to create their own state. While Jewish people were dancing in the streets of Tel Aviv celebrating the decision, the Arab nations that were surrounding Israel were on high alert. They, along with the Palestinian Arabs, refused to accept the partition plan and preferred to attempt to push the Jewish people into the Mediterranean Sea. That's why if you had a chance to listen to the show, maybe about two weeks ago, I mentioned that Ben Gurion, when he was reading the Declaration of Independence, Israel's Declaration of Independence, they were in the basement of the Tel Aviv Art Museum, because they knew a war was imminent. They knew war would break out instantaneously with their announcement of a Declaration of Independence. And that's why on May 14th, 1948, only seven months or so after the UN resolution, the local skirmishes between the Jewish community and the Arab community quickly escalated into a full out war with Jordan, Lebanon, Egypt, Iraq, and Syria. And despite being outnumbered, the fledgling state of Israel fought. And I believe God was on their side. The fighting continued for several months. Israel outnumbered 10 to one, was able to push back Egypt, was able to push back Jordan, Lebanon, and Syria. And was even able to take more territory than what was offered to them in the UN resolution. Eventually, Egypt made a truce with Israel, and they came to occupy Gaza. Egypt occupied Gaza from 1949 to 1967, and then with Lebanon they made an agreement. Israel then made an agreement with Jordan, and they signed an armistice agreement on April 3rd, 1949. And Jordan occupied from 1949 to 1967, I want you to hear that everybody, Jordan occupied what is now called the West Bank. Now here's what's interesting. The line that demarcates the West Bank from Israel is not a border. Let me repeat that. It is not a border. That line that you see on Google Maps or whatever map you look at, if you see a dotted line in Israel that is not a border, it's a ceasefire line. There's a hotel I stay at often in Jerusalem, and the road it sits on is on the old Green Line between 1948 in 1967. And the ceasefire line between Israel and Jordan then, and the place where the road is that the hotel sits on was once called No Man's Land. You didn't go in there. There was a ceasefire agreement, but if you went in there, you could get yourself in a lot of trouble. Needless to say, the Green Line is not an internationally recognized border. In 1967 Israel was once again attacked by every nation mentioned above, except Iraq. And after six days, Israel once again pushed back Syria, Egypt, and Jordan. But this time Israel took Gaza from Egypt, the Golan Heights from Syria, and the West Bank from Jordan. Israel has control of the Golan Heights and has annexed it. Israel has control of Gaza from 1967 until 2005, 2006, when they handed it back to the Palestinians, which we all know has become a complete disaster. And Israel still remains in control of the West Bank. And the Green Line, that line, that Armistice Line still remains a 1949 Armistice Line. It's a cease fire line. But there are a lot of people who want that Green Line to be a border. Like in 2011 former President Barack Obama stated, "We believe the borders of Israel and Palestine should be based on the 1967 lines with mutual agreed swaps." The '67 border president Obama is talking about is that 1949 Armistice Line, which isn't a border at all. In fact, CNN did a piece not long after Obama's statements and they opened the article like this, "President Barack Obama on Thursday made official the long held but rarely stated US support for a future Palestinian state based on borders that existed before the 1967 Middle East War." Once again, my friends, they weren't borders. It's a cease fire line. And why is this important? Well, politicians are doing all they can to create a Palestinian state out of thin air. Remember I said at the beginning of the program that from Google Maps, the dotted lines kind of looked like the lines my kindergarten twin boys used to cut things out. And friends, that's exactly what politicians all around the world have been trying to do to Israel for 70 years now. They've been trying to solidify the Green Line as a border to create a Palestinian state, when it's not a border at all. They want to cut out a very important and strategic section of Israel. Now we're going to take a break here, but when we return, we're going to continue this discussion on the Green Line, the Armistice Line. And we need to determine who controls the West Bank, Judea and Samaria, and how the Green Line fits into that. So I hope you stick around. Steve Conover: For years, politicians have been arguing about how to resolve the conflict between Israel and the Palestinian people. Some believe there must be a two-state solution. They say, if Israel can be a sovereign state, then Palestinians deserve a state of their own. They argue that when the Palestinians received their own state, that peace will finally come between the two parties. That position has been status quo for decades, and yet today, there is an even deeper divide between the two parties. So what can be done? 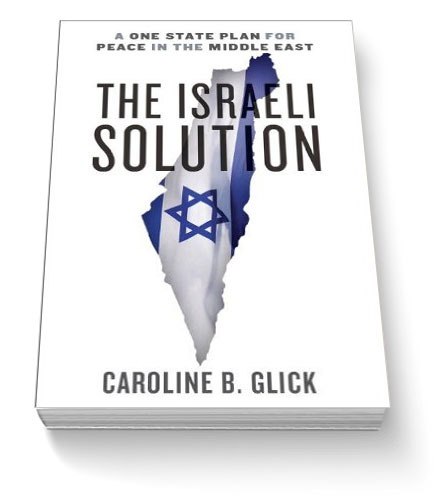 Caroline Glick, Deputy Managing Editor of the Jerusalem Post has written a book to challenge the status quo of the two state solution. The book is called The Israeli Solution, a One State Plan for Peace in the Middle East. This book challenges the conventional thought on how to bring peace between the Israelis and Palestinians, and will provide you with a different approach to solving this ongoing conflict. Order your copy of The Israeli Solution by going to FOIRadio.org or call our listener line at (888)343-6940. Again, that's FOIRadio.org or (888)343-6940. Chris Katulka: Okay. Welcome back everyone. We've been discussing the Green Line that divides Israel from the West Bank, the Armistice Line that Jordanians and Israelis agreed upon in 1949. Well, the Green Line has been around for 70 years now, and like a mythical story, the Green Line has taken on a meaning, a significance that's deeper than what it was originally intended. Many people, politicians, and even world leaders, consider the Green Line a border of some sort between the Israelis and Palestinians. A border that will divide Israel from a future Palestinian state. And let me just say that could very well happen. Israeli politicians in the past have tried to help establish a Palestinian state within the borders of the Jordan River and the Green Line, like Prime Ministers Ehud Barack and Ehud Olmert just within the past 20 years. But one thing must be made clear about the Green Line, it's not a border, and it will never be a border. People must stop treating it like a border. Remember, it's Israel, who controls the majority of the West Bank. It's theirs to control under international law. Technically, since the Palestinians and the Arabs turned down the Partition Plan of 1947, it left the international community to fall back on the previous internationally recognized document concerning the Jewish right to establish a homeland. And that's the League of Nations resolution that came in 1922 that gave the Jewish people the right to Palestine, which left Israel with everything from the Jordan River as its east border, all the way over to the Mediterranean Sea, not the Green Line. This border was not changed by the Armistice Agreement. And Israel's border remained the same even though Israel temporarily lost control of it between 1949 and 1967. Friends, Israel is the one who has control over the West Bank, which many Israelis rightfully call Judea and Samaria. Because where the West Bank is, is where a majority of the old testament accounts, the stories that we know so well from Genesis to Malachi originated. Israel is the one who has international rights over that area, and it's pointless to act like the Green Line matters when the country that controls the land is rightfully on both sides of it. It's also important to note that a true border, an internationally recognized border between Israel and Jordan was established in 1994, and it's not the green line, it's the Jordan River. East of the Jordan is the country of Jordan, and west of the Jordan River is Israel. Friends, if there is ever going to be a future Palestinian state, it's not the world leaders who determined that move for the Palestinians. It's actually Israel who has the final say to determine what they will give them, because it's Israeli land under Israeli control. It's easy to think Palestinians have control over the West Bank. Now granted, they have control over certain sections of the West Bank, in accordance with the Oslo Peace Agreement. The Palestinian Authority control cities like Bethlehem and Jericho, Ramla, Nablus, which is a biblical Shekem. They have autonomy in these areas. But in total, Israel controls a majority of the West Bank. So as the 70th anniversary of the Green Line is upon us, the 1949 Armistice Line that was agreed upon between Israel and Jordan, remember the next time you look at a map, that dotted line represents modern Israeli history. It doesn't represent a current reality. It's not a border that divides Jewish people and Palestinians. It better serves, I believe, as a reminder of God's faithfulness to protect and to provide for Israel over the past 70 years of their existence. Steve Conover: Israel on the verge of becoming a state, a teenaged Holocaust survivor arrives on her shores alone. His name is Zvi Kalisher. Little did he know his search for a new life in the Holy Land would lead him to the Messiah. Zvi, enthusiastic to share his faith, engaged others in spiritual conversations, many of which can be found in our magazine, Israel My Glory. While Zvi is now in the presence of his Savior, his collected writings from well over 50 years of ministry, continue to encourage believers worldwide. Now, Apples of Gold, a dramatic reading from the life of Zvi. Mike Kellogg: Recently I found work in the Jerusalem hospital as a handyman. The day after I started working there, something happened that was a clear sign of the Lord's guidance. When I walked into one of the wards, I saw a Polish Jew, a man about 50 years old who had been in Israel for 35 years. He was in critical condition. I felt led to witness to him. The man told me the tragic story of how his family had been killed during the Arab pogrom in 1930 in Hebron. "When my family perished," he said, "I was left alone, a teenage boy. I soon got into bad company with a gang of Arabs who smuggled morphine across the border. It was risky work, but they paid me well. In a short time, I became addicted to the dope I was smuggling and would do anything to get it. My companions took advantage of this and sent me to the most dangerous assignments, mostly to Egypt and Lebanon. "Only one day the British police caught me, and I was imprisoned for a year desperately sick and craving morphine. After my release from prison, I had nowhere to go, so I returned to my old gang in Jaffa. They received me gladly, and assigned me a new job. They bought camels from Bedouins, and instructed me to drive the animals across the border into Egypt. At first, I could not understand why they were doing this, but I soon learned the reason. They were inserting in each camel's stomach 15 bottles of morphine, worth about $4,500. The cost of a camel was only about $25 to $30. When I took the camels to Egypt, the Egyptian partner would pay the high price of the morphine and kill the poor animals right away. "By now, I had enough money to indulge my vice. I was caught again and handed over to a British court in Jerusalem. The judge was Jewish. I confessed everything and told them about my partners in crime. He sentenced me to three years in prison. Altogether, I've spent 10 years in prison. And now I am on my death bed, and no one cares to speak to me to relieve my anxious soul. You are the first person to listen." I told him that I believed in the living God, the judge of the living and the dead, and that because he loves us, he sent his only son to save sinners like us. All of a sudden he began crying and said, "I'm unworthy of anyone telling me about God and his salvation." I told him, "Christ died for sinners, that they may have eternal life. It's up to you to receive the Lord Jesus as your Savior, so that you may have that eternal life. This may be your last and opportunity." He then said, "Please pray for me," which I did. Then he looked at me and said, "Now I am ready to receive the Lord." He was very weak, but I was sure that he truly believed. I asked, "Do you believe that Jesus is your savior?" In a soft voice he answered, "Yes, and I'm ready to be with the Lord Jesus. I am no longer afraid, because I will go home to him." When I said goodbye, his last words to me were, "You saved my life." The next morning I was told that my friend had gone to his eternal home. Steve Conover: Thank you for listening today. Chris, we have a special guest joining us next week. Tell our listeners a little bit about what we can expect. Chris Katulka: I think our listeners should be coming back next week, because Danielle Moore, who's the director of Angels of Zion will be joining us. And I'm going to tell you the work that she does as she partners with the Jewish Agency in Israel, what they do is they welcome Jewish people back to the land. And the Angels of Zion Program partners with Christians to help this become a reality, helping to integrate Jewish people from all around the world back into the land of Israel. It's an amazing thing and I think our listeners are going to be really blessed by it. Steve Conover: I do too. Thank you, Chris. To listen, read or share transcripts from this were any other episode of our program. Visit FOIRadio.org, that's FOIRadio.org. Chris Katulka is our host and teacher. Tom Gallione produced today's program. Sarah Fern is our co-writer. Apples of Gold was voiced by Mike Kellogg. Jeremy Strong composed our theme, and I'm Steve Conover, Executive Producer. The Friends of Israel Today is a production of the Friends of Israel Gospel Ministry. We are worldwide Christian ministry, communicating biblical truth about Israel and the Messiah, while fostering solidarity with the Jewish people. For years politicians have been arguing about how to resolve the conflict between Israel and the Palestinian people. Some believe there must be a two-state solution. They say if Israel can be a sovereign state, then Palestinians deserve a state of their own. Caroline Glick, deputy managing editor of The Jerusalem Post, has written a book to challenge the status quo of the two-state solution. The Israeli Solution: A One State Plan for Peace in the Middle East. This book challenges the conventional thought on how to bring peace between the Israelis and Palestinians and will provide you with a different approach to solving this ongoing conflict. Zvi was working in a Jerusalem hospital. He saw a man that was in critical condition and he felt led by the Lord to witness to him. Zvi listened as the man told him about his life. There were tragic things that happened to him but also choices he made that destroyed his life. Zvi shared with him about the Living God, the One who would judge for all his sins. Hear what happened next as this man heard the Gospel. Loved it, never heard of the green line before. This was my first teaching on this subject. As one who is very interested in reaching the Jewish Community with the gospel this was very helpful. Thank you.